This will be the 13th Annual 5K Race and 1 Mile Fun Run at Falls Church High School. The course starts at the school and runs through the surrounding neighborhoods. Awards to top finishers overall and in age categories. Random prize drawings! T-shirts to all registered runners. All proceeds raised benefit the Falls Church High School athletic program. Main Gym Lobby - entrance 8. Saturday, April 28, from 6:30 am – 8:00am. Kids’ 1 Mile Fun Run will begin and end on the FCHS track. Kids will stay on the FCHS campus. 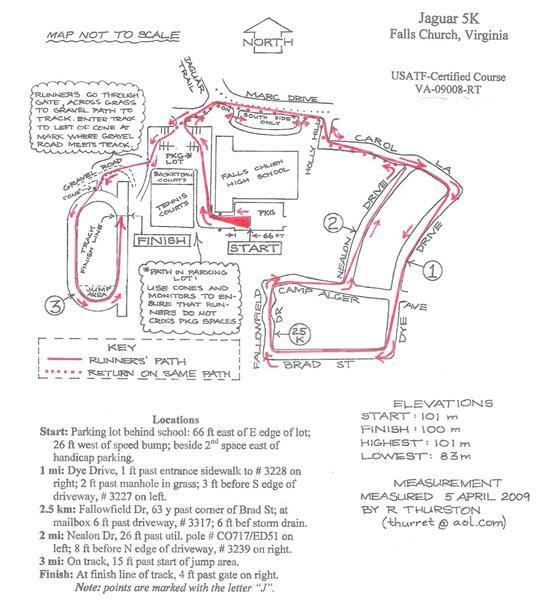 5K Run/Walk - USATF-Certified, Timing by Race Wire. This race will be chip timed. From I-495, take US-50/Arlington Blvd, exit 50A-B towards Arlington. Merge onto US-50/Arlington Blvd. Turn right at first light onto Jaguar Trail. No headphones, animals, in-line skates, skateboards, baby strollers, bicycles or roller blades please. This event will take place Rain or Shine! Race directors may edit the course for safety and/or for highway regulations or may cancel this in the event of sever weather. Race directors reserve the right to deny participation. No refunds to late arrivals. The following must be signed by the runner or parent/guardian if under 18: Registrants and their accompanying family members and friends participating in the 5K Run/Walk or Fun Run on April 28, 2018, I hereby assume full responsibility for the risk of property damage, bodily injury, or death. By your signature below, you certify your understanding that the race will occur, in part on property not owned by the Fairfax County School Board (FCSB). Therefore, you also certify your understanding that neither the FCSB nor its employees and volunteers have any responsibility for the maintenance and condition of that property. Further, you understand that the FCSB provides no accident, medical, or health insurance coverage for race participants. By your signature below, you certify that, to your knowledge, you and your child (if applicable) are medically able to participate in this 5K or Fun Run race. In consideration of the safety of all participants, you understand that absolutely no baby joggers, baby strollers, headphones, animals, skateboards, skates, rollerblades, or bicycles are allowed on the 5K or Fun Run course. In addition, you understand that if the 5K or Fun Run is canceled by circumstances beyond the control of the organizers, your entry fee will not be refunded. Further, I understand that photographs, motion pictures, recordings or any other record of this event for legitimate purposes may be posted.